The one thing I really love is about Art Naturals is that it helps me tan and provides my skin with nutrients that leave it really moisturized. This oil contains botanical oils such as avocado and jojoba oil which promote intense moisture. It also contains green tea, chamomile and anti-aging sea algae extracts that help guard your skin against everyday environmental aggressors. It does not contain a sunscreen so if you’re not using one before you apply it make sure not to stay in the sun too long. What I really love about Art Naturals Protective Body Tanning Oil Spray Serum is that it even tones and tightens my skin. The coconut oil tones and tightens skin so if use it liberally wherever you see dimples on your body. It won’t make them disappear but it really does help smooth and somewhat diminish the dimpling affect. My skin sometimes feels dry after I shower even with body washes that claim to leave your skin soft so, for extra soft skin, I apply the oil when I get out of the shower while my skin is still damp. I make sure to rub it in well, it spreads quickly as it is oil but it takes a little time to absorb. It doesn’t spray like a mist; it sprays in a straight line which is great so you know where you’re spraying. It leaves me with really soft skin. If I’m using it while tanning I put on sunscreen first then apply liberally over the sunscreen to help keep my skin hydrated. You’ll notice that the oil will linger on your skin after you shower or after swimming but it’s not greasy. 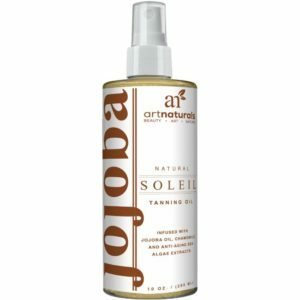 Art Naturals Protective Body Tanning Oil Spray Serum has a really nice and light coconut scent with a hint of jojoba. Coconut is my favorite scent in any product, it’s just so tropical. I don’t live in a country where we have summer weather all year round so anything that reminds me of the tropics is great in my book. This oil is amazing! I am so happy and impressed with the results that I have to try other Art Natural products. I would give Art Naturals Protective Body Tanning Oil Spray Serum 9 out of 10. If you’re looking for a product that will help you tan and protect your tan, give you super hydrated skin that you can use while tanning or just a great overall body hydrator, look no further. Highly, highly recommend!